Product prices and availability are accurate as of 2019-04-21 13:08:57 BST and are subject to change. Any price and availability information displayed on http://www.amazon.com/ at the time of purchase will apply to the purchase of this product. Our reusable nonstick stovetop protector catches drips and spills to eliminate stuck on mess, keeping your gas range stovetop burners clean. Forget wasting time and effort scrubbing last weeks cooked on spillover and save money on cleaning chemicals and towels, all while extending the life of you range! Don't settle for thin liners made of inferior materials that curl, crack, tear, smoke or releases chemicals. 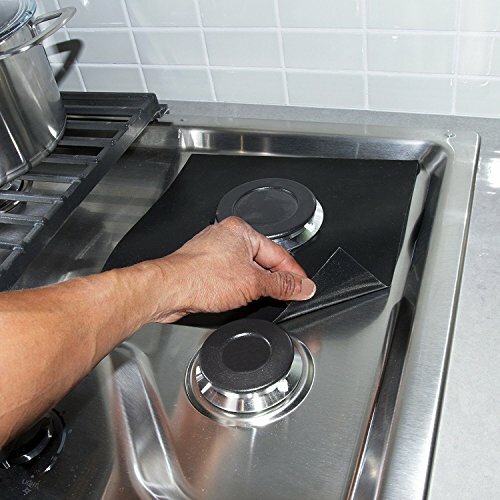 Our stovetop burner liners are twice as thick as the competition, making them durable and easier to clean. These stovetop liners are washable, reusable and reversible. The nonstick coating makes cleaning a breeze. Wipe down with warm soapy water or toss them in your dishwasher! Stop wasting time scrubbing and start protecting! Our stovetop protectors are precut, making them easy to install. Just trim the inner circle and adjust to different burner sizes. 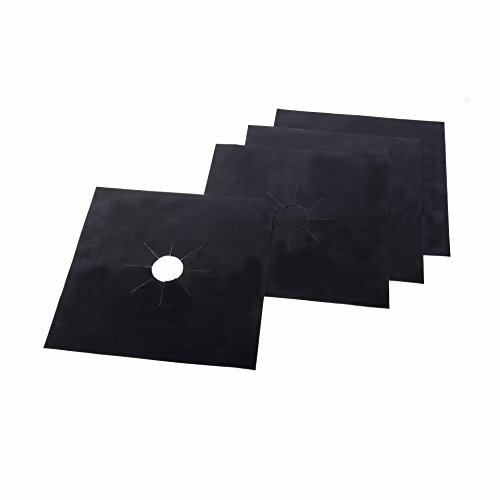 With a dimension of 10.6" x 10.6" inches, these liners will fit most gas range stove burners. Our stovetop protectors are 100% PFOA & BPA Free and temperature resistant up to 500°F, but avoid direct contact with flames. If you love our stovetop liners, we recommend lining your oven with a Kitchen + Home oven liner and protect your stove inside and out! 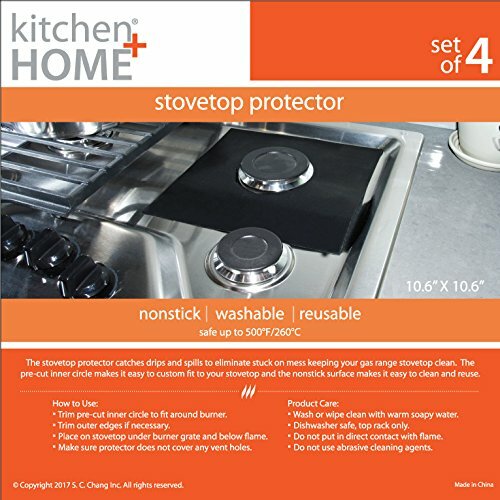 KEEP STOVE CLEAN - Our reusable nonstick stovetop protector catches drips and spills to eliminate stuck on mess, keeping your gas range stovetop burners clean. Forget wasting time and effort scrubbing last weeks cooked on spillover and save money on cleaning chemicals and towels, all while extending the life of you range! HEAVY DUTY - Don't settle for thin liners made of inferior materials that curl, crack, tear, smoke or releases chemicals. Our stovetop burner liners are twice as thick as the competition, making them durable and easier to clean. EASY TO CLEAN - These stovetop liners are washable, reusable and reversible. The nonstick coating makes cleaning a breeze. Wipe down with warm soapy water or toss them in your dishwasher! Stop wasting time scrubbing and start protecting! 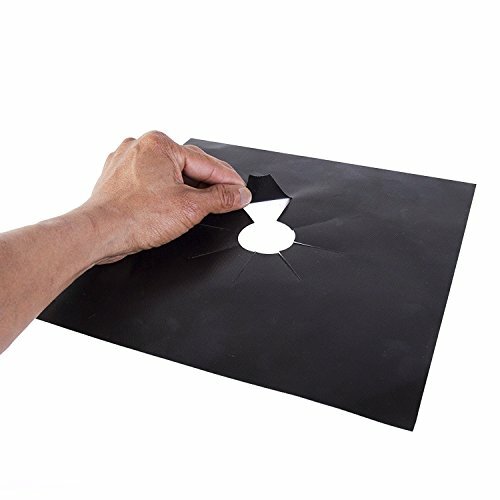 PRECUT - Our stovetop protectors are precut, making them easy to install. Just trim the inner circle and adjust to different burner sizes. With a dimension of 10.6" x 10.6" inches, these liners will fit most gas range stove burners. FDA APPROVED - Our stovetop protectors are 100% PFOA & BPA Free and temperature resistant up to 500°F, but avoid direct contact with flames.